Lying pays. And this wasn’t the only account she had, she had close to a million donated to her. 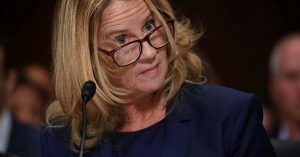 Christine Blasey Ford used some of the more than $600,000 donated to her after she accused Supreme Court Justice Brett Kavanaugh of sexual assault to pay for security and housing, she said in a rare public statement. Just days before the Senate Judiciary Committee was set to vote on Kavanaugh’s Supreme Court confirmation, Ford publicly came forward to accuse the judge of sexual misconduct decades ago. She accused Kavanaugh of pinning her to a bed during a house party in Maryland in the early 1980s, attempting to remove her clothes and putting his hand over her mouth when she tried to scream. At the time of the alleged incident, Ford was 15 and Kavanaugh was 17, she said, adding that Kavanaugh was drunk. Kavanaugh repeatedly denied the allegations, and after a highly publicized and emotional hearing regarding the accusations, he was confirmed to the bench on Oct. 6.